Partnerships between incumbent financial businesses and fintech start-ups are becoming the talk of the town as corporates move away from an ‘us versus them’ mentality towards one of ‘we’re in this together’. We believe there are many synergies to be found between corporates and start-ups, and the desire to work together is replacing the Darwinian ‘disrupt or die’ vibe of earlier debates. 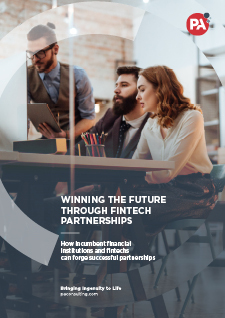 Such partnerships have the potential to accelerate banks’ development of capabilities needed to help the financial sector innovate and flourish. This rising interest in collaboration has been accompanied by more of our clients asking us, ‘how exactly do we make these partnerships work?’ Despite a common desire to work together, stories about successful, productive and structured partnerships are few. Download our latest report to understand how to make a successful link between financial institutions and FinTechs.